Today I am sharing a miss you card with watercolor accents. 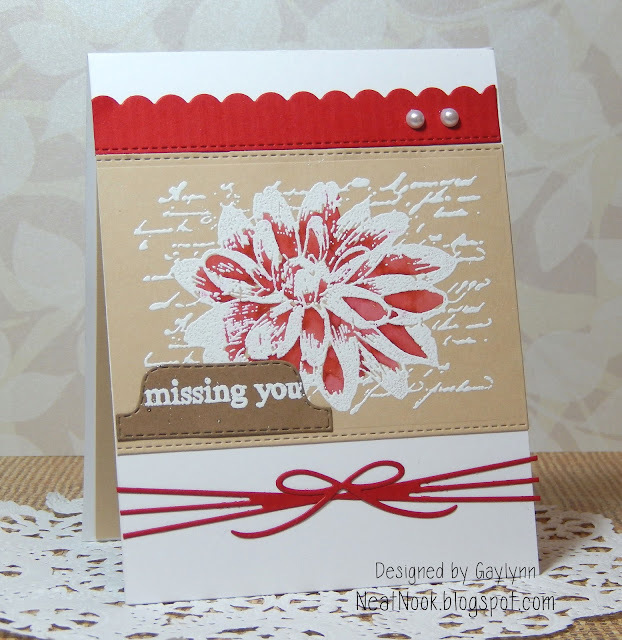 This flower is heat embossed and then watercolor accents were added. I added a few adhesive pearls, die-cut trimmings and accents. Unity Stamp Co. color challenge on Facebook. Clean and Graphic Style accenting the red only. Supplies: Unity Stamp Co. stamps from December 2014 KOTM Warmth of Winter and Miss You So Much; dies from My Favorite Things, My Creative Time and Pretty Pink Posh, adhesive pearls, embossing powder and distress marker. 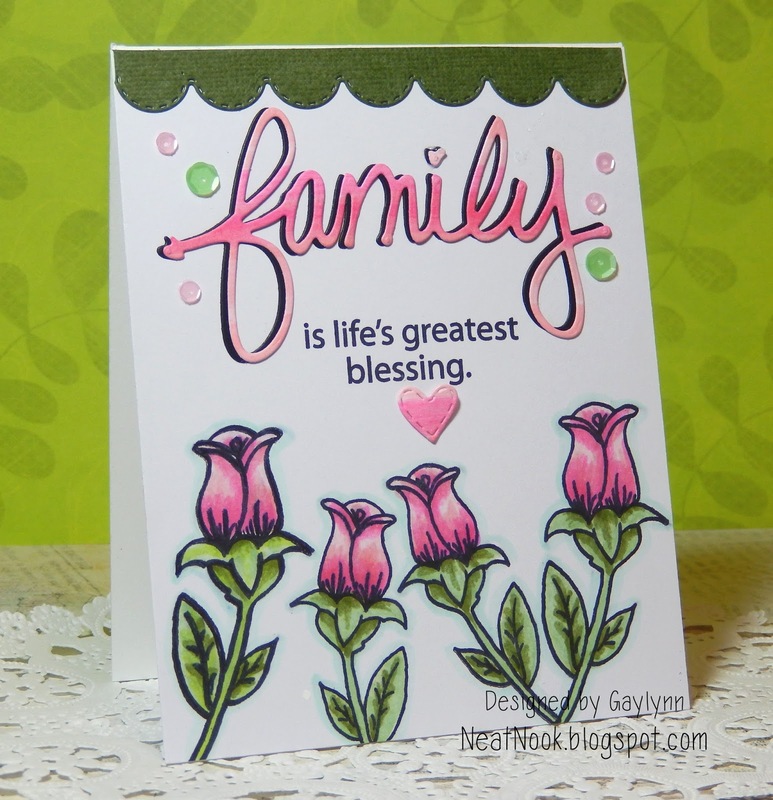 This is a family card with a bold sentiment and pretty pink roses. Sentiment: Family is life's greatest blessing. This one started with just the flowers and then I expanded the coloring to the sentiment and heart in ombre. I made this with my Mom in mind. It could be for any family member's celebration like birthday, Mother's Day, sister, etc. Freshly Made Sketches #224 ~ A Sketch by Jen T.
Supplies: My Creative Time stamps and dies from Bloom Where You Are Planted, Family is Everything, Fun Stitched Edges and Stitched Sweetheart & XOXO Dies; Copic Markers and Pretty Pink Posh sequins. I know of two very special people who need these words right now. 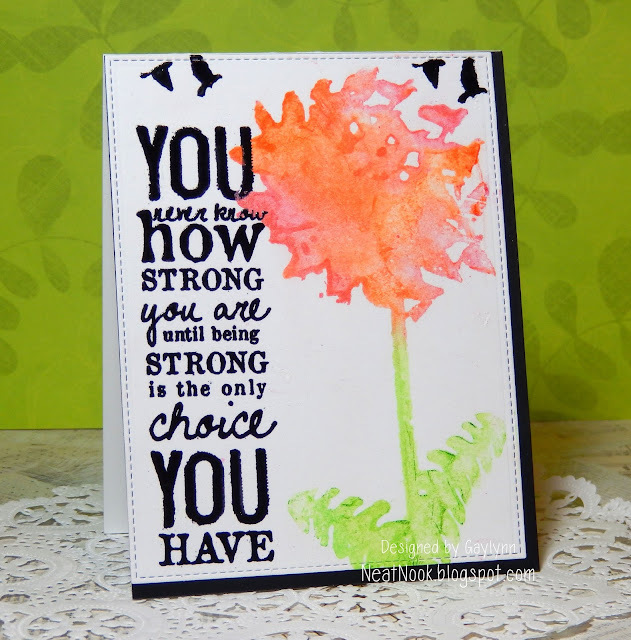 This sentiment was huge and bold, so I paired it with a big and bold mixed media flower. This will work for any loss, sympathy, divorce, get well or encouragement. Supplies: Unity Beautiful Elements Mixed Media Kit 1 by Jo-Ja and Strong is the Only Choice; MFT die-namics, Fabercastell Gelatos and embossing powder. 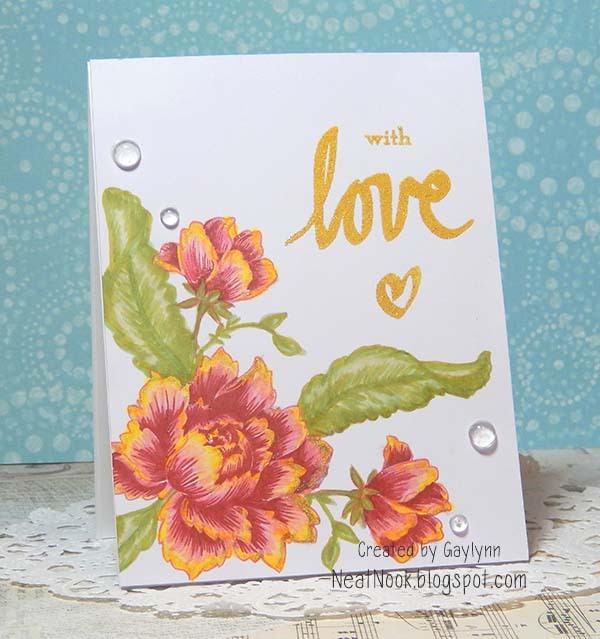 A watercolor celebration card with pretty peony flowers for today. This is watercolor with pencils and stamping. I love the way it turned out. I softened the look a little with a vellum sentiment panel. Supplies: Unity Stamp Co. July 2015 SMAK Happy Little Moments and Bright Happy You sets; Pretty Pink Posh sequins, vellum, embossing powder and Derwent Inktense watercolor pencils. Have a "lovely" Valentine's Day. Today I have a penguin shaker card with a tropical theme. Sentiment: I miss you. That is all. There is a mix of coloring in this for a tropical feel. I just love this little penguin and the expression on his face. 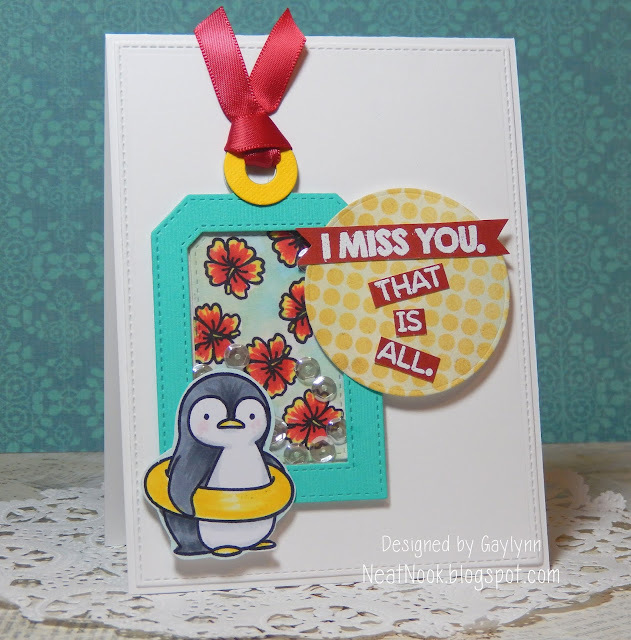 I paired him with a miss you sentiment and a hibiscus shaker tag background. Supplies: MFT Stamps and die sets from Penguins in Paradise, Tag Builder Blueprints 4, Blueprints 15 and 22; Copic markers, distress markers, Pretty Pink Posh sequins, ribbon and white embossing powder. I hope this brings you a smile. Good day. This is a feminine and sweet thank you card. 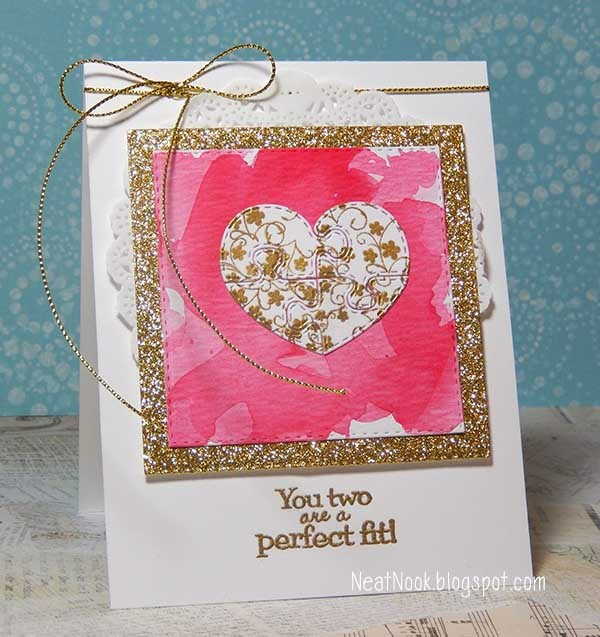 I used the soft colors of lavender and pink and trimmed with layered lacy die-cuts. Sentiment: Thank you from the bottom of my heart. The background is embossed and the flowers were stamped, colored and die-cut. The sentiment is heat embossed in silver. 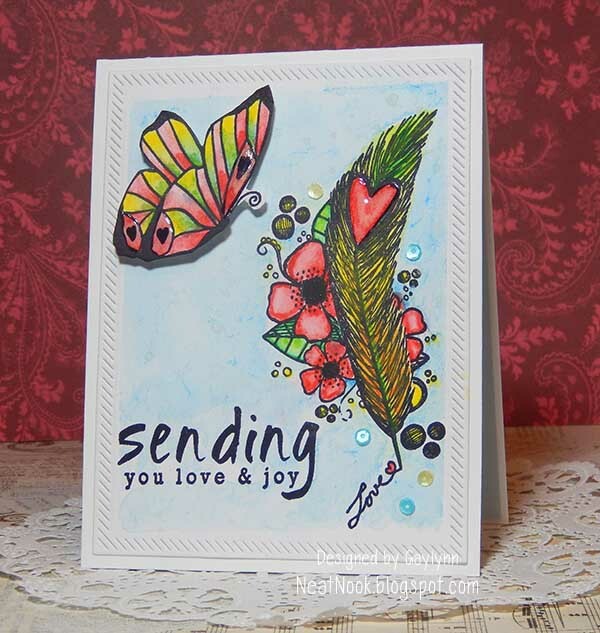 Supplies: Lil' Inker Designs stamps and dies from Border Builders Die Set, Cover Up Die Pieced Chevrons, Send Pretty Greetings and Vintage Ink; Copic markers, silver embossing powder and gems. Thank you for visiting. Have a wonderful day. Today I am sharing a watercolor card with a mix of stamping and watercolor pencils. It is going to my sweet Mother-In-Law. She loves butterflies. Sentiment: Sending you love & joy. This one I will use for Valentine's Day but it could be for any occasion, really. The butterfly is popped up. For added sparkle, the hearts were glossed and sequins were added. Supplies: Unity KOM 2/2015 Happiness Looks Gorgeous and Blossoming Thoughts & Wishes; MFT die-namics, Inktense pencils, Pretty Pink Posh sequins and Glossy Accents. Have a fun Super Bowl weekend. A masculine vintage car card, because we can't forget about the guys. Sentiment: You are totally and utterly amazing. 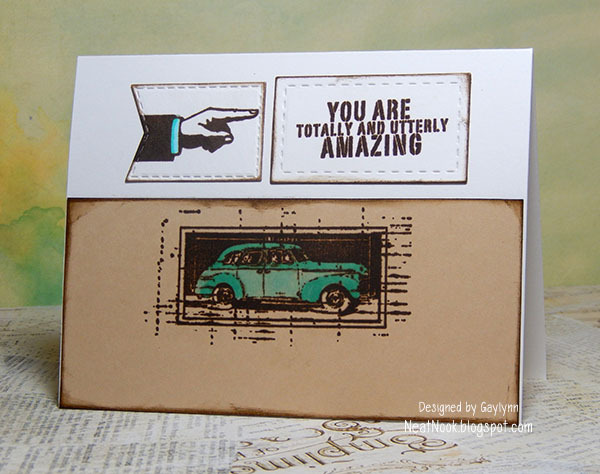 I love this vintage car, so I made the rest of the card distressed and vintage too. Unity Show and Tell Facebook Group ~ Week 1 sketch challenge. Supplies: Unity KOM 5/13 Totally and Utterly Amazing, SMAK 3/13 Chalk It Up Elements; Copic Markers, MFT die-namics, Lil' Inker Designs dies, Ranger distress ink. Here is my card with beautiful peony flowers for tonight. It will be a Valentine for my Mama. This sparkles more than the photo shows, on the sentiment and the flower edges. I tried creating a variegated look to the flowers in red, pink and yellow. There is a mixture of stamping and Copic coloring here. Inspired by Gayatri's flowers and leaves. Supplies: Altenew stamps, Pretty Pink Posh clear droplets, Copic Markers, Wink of Stella, Ranger archival ink, Gold Glitter embossing powder. This one is a Valentine for my daughter and her boyfriend. This would work for a wedding, anniversary or bridal shower as well. Sentiment: You two are a perfect fit! This card was made in a few different steps. The background is watercolor and framed with glitter paper. The heart is made of puzzle pieces and the flowers were heat embossed in gold, as was the sentiment. Supplies: My Creative Time stamps and dies, Sakura watercolor paint, gold glitter paper, ColorBox ink, Bo Bunny doily and gold embossing powder. This is going to be a Valentine for my son, because he's kinda cool. Sentiment: Be cool & be mine. This fox is cool don't you think? I made it look a little rustic with a crimped and distressed background and heart. I used shading with distress ink and markers. 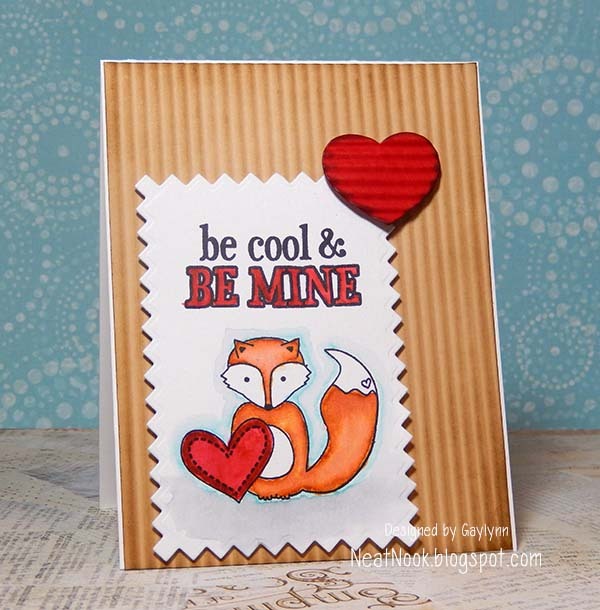 Unity Stamp Company My Foxy Valentine and January 2013 KOM All Hearts & Love; MFT Blueprints 22 & Pinking Rectangle STAX, Ranger distress ink and markers and paper crimper.